Born of the timeless vision of the sages and seers of India, the Upanishads are a treasure trove of wisdom enlightening life as it unfolds in its many dimensions. Unique among the ten principal Upanishads the Mandukya dwells deep and wide into the power and mystery of Om… the seed sound of creation. To be able to utter the divine Om with our mortal tongues is a itself the culmination of which can only be in a musical odyssey led by the vocal genius of Pandit Jasraj. Spread in three volumes of the collector item the enchanted journey from omkaar to Om covers the four stage of human consciousness. from the waking stage… to the dreaming then to the dreamless depths… and finally to Samadhi. The genesis of the musical mission dates back to the earlier part of the 20th Century, when the Indian saint Shree PUROHIT SWAMI, having imbibed the depth and expanse on his favorite Mandukya Upanishad through daily recitation, included it in his life's work - that of presenting the spiritual wisdom of ancient India to the contemporary world. Thus, in collaboration with his friend and host, the Nobel laureate W.B Yeats, the English translation of the Mandukya shoklas were created in the hermit-like seclusion of the Spanish island of Majorca. 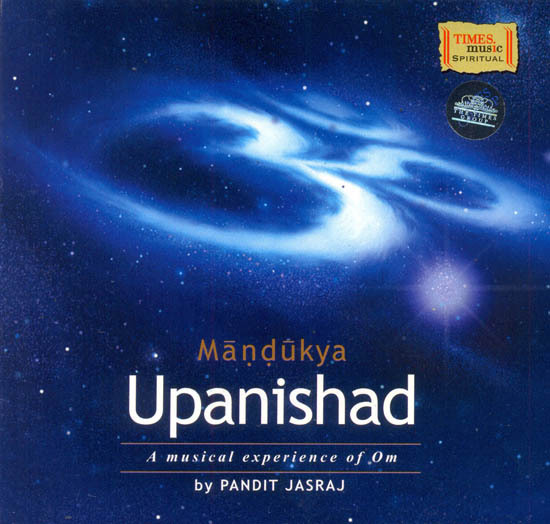 The musical dimension of Mandukya Upanishad, however, was to travel a different path, as INNER VOICE, a more recent entity, picked up its strains from the literary inspiration and the collective consciousness of resurgent India, and sought to present a musical experience. And TIMES MUSIC, finding in it an echo of its own chosen mission, gave it this platform of a major international album. Counted among the ten principal Upanishads, the Mandukya embodies, the distilled essence of all that the Upanishads ultimately have to offer. With just twelve verses, it is the shortest in length, and focuses on the spiritual ascent of man along the various states of consciousness from the waking state to the ultimate Samadhi. In its exploration of the seed sound Om, the Mandukya is perhaps the ideal Upanishad that can be approached along the ethereal path of sound and music. And, indeed, it is Indian Classical Music alone, with its depth and expanse, its natural grasp of time, space and the spirit of life which could have attempted the journey. And this is precisely what one of India's contemporary cultural ambassadors to the world, the music maestro PANDIT JASRAJ has set out to achieve. The highly evolved spiritual quality of his mesmeric singing style, the intuitive brilliance of his musical achievements mark him as the chosen one for this projects. And as the listener will soon discover, he has given it to his heart and soul. SHAARANG DEV, the new age musical min, has edited and orchestrated the boundless vocal exploits in subtle harmony with the universal ear. We are also fortunate to be able to present an incisive introduction specially written by the revered Dr. JULIUS LIPNER, from the Faculty of Divinity, Cambridge, which may adequately enlighten the international audience even before the music unfolds. We hope that this introduction will enable you to enjoy what can only be described as a complete and enriching experience - a feast for the mind, heart and spirit. No other civilization is as sophisticated as the Hindu in the exploration, shaping and transmission of the unfathomable complexities of the world of sound. It is through sound that we express the rhythms of our bodies and the environments in which we interact, and shape our worlds of meaning and purpose. The Mandukya Upanishad is a worthy subject for tapping the cumulative Hindu experience of the multifaceted world of sound. The Mandukya Upanishad is traditionally ascribed to the Atharva Veda, one of the four ancient branches of Hindu scriptural learning. It is composed in a language called Sanskrit (which means 'well wrought') and can be dated to about the beginning of the Common Era. As an Upanishad it is regarded as belonging to a section of the Vedas - the Vedanta - that sums up, in depth and wisdom, the teaching of these scriptures. Sanskrit, for the Learned, is the language best suited to the elucidation and harnessing of the powers and meanings of sound. The Mandukya Upanishad is only twelve verses in length, yet it is an excellent example of the distinctive method of the Upanishads. It reveals - as an exercise in contemplation - the significance of the mystic syllable am (pronounced "Oh-m"). This sound, which reverberated throughout the philosophy, ritual and contemplative practice of Sanskritic Hinduism through the ages to the present day, is a composite of three units, A, U, and M (in combination, A and U are pronounced "Oh"). Verses 1 and 2 declare that the syllable am encapsulates everything- space, time and indeed the horizon beyond - in which we have our fullest being. This all is Brahman identified with our deepest Self (Atman). Verses 3-7 take us on an interior journey of discovery towards this all-sustaining, all-encompassing, inmost Reality. First we pass through the waking state and its multifaceted variety, then through the dream-state and its surreal experiences, next through the dreamless state of refreshing deep sleep, and finally to the state-Beyond - the turiya - 'the unseen, the ineffable", the utterly peaceful and non-dual. Note that this is an increasingly submitive hierarchy, that is, outward and transient multiplicity is unified and drawn ("subsumed") into a more subtle state which in turn is subsumed into a higher state which finds its culmination in the most enduring, encompassing, intimate turiya. Note too that this progress is one of increasingly expansive, unitive, blissful awareness. Subsumptive hierarchies of this kind are typical of Upanishadic method, and we have a prime example here. Verses 8-12 show how the syllable Om is caught up in this subsumptive process: the letter A, U and M correspond to the first three states respectively, and the sound in its totality encapsulates the deepest reality the Atman itself. But this whole experience is not just an inconsequential exercise in knowing: it makes a difference to the kinds of lives we live. Verses 8-12 also indicate that the knower of this process progressively integrates his/her being and achieves a unitive understanding of the multilayered world which results in positive (shiva) action. The lesson of the Upanishad thus purports to be both descriptive as well as benignly prescriptive: know, and in the process of knowing, act constructively. A number of experts in the harnessing of Sanskritic sound have combined to bring you this unique listening experience. The translator of the Mandukya in this recording, the Maharashtrian Brahmin Shree Purohit Swami (1882-1942) was a sage who spent his eventful life striving to propagate the wisdom of his ancestors both in India and in the West. His collaborator in the translation, the Nobel laureate W.B Yeats, noted that the text was "twice as much his as mine". Twice as much, that is, through internalization and then the expression of this understanding in the Swami's life and writings. The Mandukya Upanishad had a special place in the life of the well-known sage; he would recite it meditatively daily. Of the distinguished vocalist himself, Pandit Jasraj, no one even moderately familiar with the contemporary scene of North Indian Classical vocal music can be ignorant. Immensely experienced in his art, of which he is widely acknowledged as a most creative and vibrant transmitter, and universally acct aimed in India and abroad, Panditji has excelled himself in the interpretation of the Upanishad's profound teaching. Panditji's singing not only awes the ear, but delights the heart and elevates the spirit: It is an inspiring performance that will stand the test of time. Inner Voice the creative force behind this project, is fast emerging as a leading player in transmitting and revitalising India's cultural and religious heritage. It is doubtful if any Upanishad has been subjected before to such an wholistic, innovative treatment, and Inner Voice and Times Music are to be commended for their successful collaboration. I am proud to be associated with this inspiring venture. The Upanishads of philosophical texts were written by sages of India between the eights and fourth centuries BC. They form the final part of the Vedas, the sacred texts that constitute Hinduism most sacred literature. Tradition recognizes 108 Vedic Upanishads of which 10; including the Mandukya Upanishad are considered the major Upanishads. The Mandukya Upanishads is the shortest of all the Upanishads just 12 verses in length and form the concluding portion of the Atharvaveda. It is a meditation the sacred syllable Aum (Om)… the seed sound of the creation revealing the mystery and significance behind it. The Mandukya Upanishad embodies the distilled essence of the wisdom of the Upanishads focusing on the spiritual ascent of man through the various stages of consciousness from waking to ultimate Samadhi. The doyen of the Mewati gharana, Pandit Jasraj is one of the foremost vocalists in the album classical scene today. Born in 1930 he trained under his eldest the late Pandit Mani Ram. Pandit Jasraj also bears traces of the Jaipur and Gwalior gharans; having been significantly influenced by Pandit omkarnath Thakur, bade Ghulam ali kahn and Ustad Amir Khan. Pandit also gives credit to the appreciative listening public for having been major influence in his career, for he says that the increased knowledge levels among today audience has forced an artiste to better himself and also deliver his best. Naturally the appreciative audience has reciprocated by honoring Pandit Jasraj with several awards; most notably the Padma Bhushan and the Sangeet Natak Academy award. Pandit has groomed a number of disciples such as Sanjeev Abhyankar Ratan Mohan Sharma, Tripti Mukherjee who are all set to carry the Mewati gharana into the next generation. Panditji set great store by the guru shishya tradition and believes that the only way to achieve immortality is to groom a set of worthy disciples. Pandit immortality if further assured his manifold contributions ones of the most unique being the Jasrngi Juglbandi an innovative form of jugalbandi based on the ancient moorchana technique where a male and a female singer sing two different ragas simultaneously. Pandit Jasraj has a keen interest in ancient musical forms and has researched deeply into the 500 year old field of Haveli sangeet. This acclaimed and much honoured musician has well and truly cemented his place in the Pantheon of Indian classical music legends.